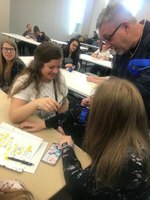 Congratulations to Katie Wollschlager who is the February Student of the Month at Milbank High School. Katie is the daughter of Janelle and Brian Wollschlager. Congratulations to Jordan Riley, the November Student of the Month at Milbank High School. Jordan is the son of Holly and Mike Riley. Congratulations to Justine Wiik, the January Student of the Month at Milbank High School. Justine is the daughter of Jennifer and Joe Wiik. We have added a lot of school spirit to our facilities this summer! 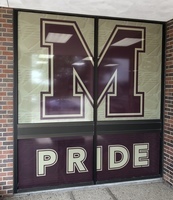 Be sure to notice the Pride window film near the MHS entrance!